Dharti sab kagad karun, hari goon likhe ne jaai. If entire earth is used as the paper, still one can not write about God. My entire life is filled with his grace and blessings. I believe my life would have been completely wasted with no purpose and direction if I wouldn’t have found Shri Babaji Maharaj as my guru. Whatever I have today, is all due to Shri Babaji Maharaj’s grace, whatever peace and happiness I experience today is all by the grace of Shri Babaji Maharaj. When Shri Babaji Maharaj’s body was alive, I never spent a single day of my annual leave away from him. I never spent more than 2-3 hrs with my family or friends. As part of my service, wherever I was posted, Shri Babaji Maharaj always blessed us by visiting us – sometimes twice a year, but at least once every year. And every time he would stay for at least 1 month and give us the chance to serve him. First time he visited us in 1968 in Ambala. He was accompanied by Shri Jawahar Singhji Meel. Shri Baijnathji, Shri Niwasji and Bhai Narayan (now Col.Narayan) also visited during this and stayed for a week or so. In the evening often Rishaldaar Sawai Singhji Hirana, Captain Bhim Singh Shekawat and others used to come to see and get Shri Babaji Maharaj’s blessings. During this time Shri Babaji Maharaj also went for a pilgrimage to Kurukshetra. After staying for nearly a month, Shri Babaji Maharaj left for Rajasthan via Haridawar, where he bathed in river Ganges. Then again, when I was at military college in Pune finishing my engineering, Shri Babaji Maharaj visited us. He was accompanied by Seth Pyarelal Sanganeriya. Shri Babaji Maharaj stayed with us for about 1 month again and went back to Rajasthan via Mumbai. During this time, Bhai Narayan, Ghasi, Ramchandraji and others visited Shri Babaji Maharaj to seek his blessings. During this time, Shri Babaji Maharaj constructed ‘Om Alakh Niranjan Stuti’ and other invaluable sayings which I wrote in my diary. Many of my friends from army often used to visit him and used to say ‘this Babaji knows everything; he is knower of past, present and future (Trikalagya)’. In 1973, during my annual leave from 15th to 25th February, I had the fortune of traveling with Shri Babaji Maharaj from Sikar to Gorakhpur, Sitamandi, Janakpur Dham and Kathmandu. On the way back we reached Ambala and Shri Babaji Maharaj went back to Laxmangarh via Delhi. On 21st June 1973, Shri Babaji Maharaj visited us in Sikandrabad. That time I was doing an advance course in Sikandrabad. Bhai Maliram Bijarnia was with Shri Babaji Maharaj and they left for Tirupati on 3rd July. Then again on 9th September, when he was on his way to Kanyakumari, Shri Babaji Maharaj visited us in Sikandrabad for a week. On his return from Kanyakumari, he stayed with us for about a week and left for Jaipur on 30th September. This time he was accompanied by Bhai Gopal. Dehradun – 1978 to 1982; every year visited for a month during the months of May and June. Dehradun – visited during end May 1983 and after staying for 4-5 days left for Rishikesh. During that time I was posted in Varangaon, Maharashtra. Dehradun – visited us during 14th – 27th June 1985 and when leaving he told me and my wife “children, now you only come. Wherever you have been posted, I have visited you. Whatever you have thought of, Shri Nathji Maharaj has fulfilled your desire. Now this body will not be able to come again. You only keep coming. Always be happy and keep remembering Shri Nathji Maharaj”. From 11th August 1985 onwards I was detailed on temporary duty at Infantry School, Mahu. 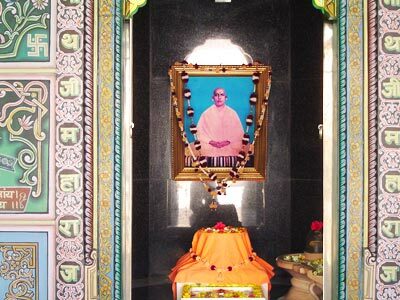 Before traveling to Mahu I decided to spend three days in the service of Shri Babaji Maharaj at Laxmangarh. At Mahu on 19th August I received call from Bhai Lala saying that Shri Babaji Maharaj has immediately asked you to come over to Laxmangarh. That time I was in the bathroom – I immediately got dressed and without obtaining any leave, I left Mahu. As I came out of the officers’mess, I saw a car coming my way and I requested for a ride to go to Indore to catch my train. The car was also on its way to Indore and I was able to catch my train and reached Jaipur. From there, on 20th August I reached Laxmangarh ashram at 11am.